Oh how useful! Jeez… I can tell you now that i’ve checked over the form and it looks ok to me, no obvious errors so I’m betting they have some tight password restrictions that they’re neglecting to inform the user about. Yep that’s right, there is no help or error text on the form when you go back to it. Not even a little red asterix anywhere to give you the teeniest of hints where you might need to focus your efforts. Needless to say i’m giving this one a miss. 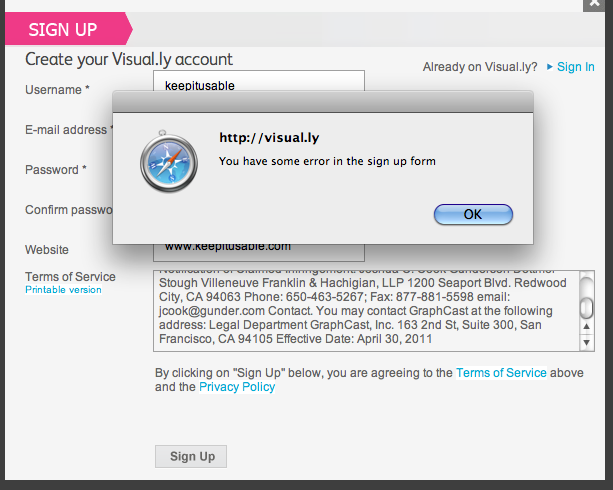 One less user for visual.ly due to poor error handling and total lack of help text. Whilst i’m on the subject, here’s another lovely worded piece of error text. It’s so friendly, understanding and helpful (not!). Referring to a person as ‘this user’ is never a good thing and you’re sure to annoy them by de-peronalising them in such a way. It’s also not helpful to say the number of errors. Why does that help the user to complete the form in any way? It’s much better to be informative in a readable manner. Don’t be afraid to be informal – speak the user’s language. Lighten it up a bit, maybe you should even apologise so the pressure’s off them – it’s not that they made an error, it’s more than likely the form was poorly designed which caused the error in the first place. – Think about whether you could add some funky graphics. Careful not to hinder the form usability though – it still needs to be focussed without anything distracting rather than contributing to completing the form. Don’t forget to follow usability guidelines too! – Show the user which fields needs correcting. They should be visually different to the other fields. – Put errors in place, rather than waiting for the user to press the ‘send’ button. Less pain, more gain! – Avoid technical language at all costs. Use words your audience will understand. Think I have similar patience levels with websites and software – if it annoys me too much too quickly, I will dump them just to spite them 🙂 We all know this as users, but for some reason when a user is also a project manager for a web application, these kind of usability frustrations suddenly don’t figure in plans. I am not immune to that blind-spot either – occasionally I have to give myself a nudge to remember the user is the final judge. Error messages are a particular bugbear I have – for some reason the usual look of them implies you should panic – red border, exclamation mark, red text – all thats missing is a fire bell. And spot-on; never call the user, “user” – you are not expecting the software to be sensitive to your needs, or massage your neurosis – but it doesn’t need to be rude either. Developers commonly complain about their server error messages containing no helpful information – but interestingly getting them to see the value of better error messages remains a challenge sometimes. But usually by reminding them they were effing and blinding at server error emails earlier that day, about the unhelpful content, puts the point across. Also helps with testing, of course to have more representative error messages appearing. Quality of error messages always suffers, because it constantly ends up at the end of the development task queue. Then of course, there ends up no time to do them,and because they haven’t been specifically requested, end up easily omitted. This is not across the board, I dont want to generalize – but I don’t exactly have a application example springing to mind right now either! That has been improvements, as the importance of usability has really permeated into general development approaches. What’s commonly omitted in requirements are error messages – and they are easy to specify at that stage, because you have got the scenarios, both positive and negative, to work from. Hey Paul, thanks for commenting. Really interesting to read your view as to why the quality of error messages can be so poor. You know I do agree with you on the apology part. I did wonder whether or not to include it because to me it would sound odd to say something like ‘we’re sorry…’ but with careful wording you probably can concoct something that works and like you say, so long as you don’t go OTT. I think what’s more important is that the user doesn’t feel like it’s their fault, that they did something wrong. You find this in user tests a lot – they always blame themselves and many even apologise. That’s why I think keeping things fairly light-hearted can work and I think we can learn a lot from the great 404 pages around these days. Unfortunately form errors aren’t as fun to design as 404 pages but hopefully they’ll follow a similar path. cut-scenes as you have been watching TV. They can hone your reflexes and response skills during the several events happening on the screen. Call of Duty Black Ops is a actual accepted aboriginal being ballista video game. The sponsorship model for games along with the new advertising possibilities for websites gave birth to free online games. Supervisor. Here’s a look at the beat features of the Panasonic TX-P42C10B Plasma Television.